The recent scenes of heartbreak at the border as migrant parents were separated from their children weighed heavily on Rebeca, a mother of three living in Austin. The fear of being separated from her family was in part what led her to apply to become a U.S. citizen in early October about a decade after leaving her home in Mexico. Given the current political climate and evolving immigration policies, she reasoned that obtaining the full benefits of citizenship — including the guarantee of being able to stay in the country without concern of losing her legal status — would offer some peace of mind for her husband and her children, who were all born in the United States. Eight months later, Rebeca is instead at a standstill. Like tens of thousands of other Texas residents, she’s been caught in a swelling backlog of applications that has, in some cases, more than doubled the length of time it takes a legal permanent resident to become a citizen in Texas. The increased wait times have proved to be excruciating for applicants like Rebeca and their families who often worry the delays mean their cases could go awry. “We’re living with the uncertainty of what could happen,” she said. That sentiment appears to have carried over from the last presidential election cycle, when thousands of legal permanent residents in Texas applied for citizenship in hopes of securing their place in the United States. But against the backdrop of an administration working to upend long-standing immigration policies, the growing backlog in applications has emerged as a pressure point in the immigration system, according to lawyers working with naturalization applicants across the state. Those lawyers worry that the backlog affecting thousands of legal permanent residents — some of whom have lived in the country for decades — is reflective of a shift in a system that has long been key to the nation’s immigration policies. Naturalization applications from legal permanent residents — commonly referred to as green card holders — spiked ahead of the 2016 election, leading to a surge in the backlog of applications in Texas. It’s an uptick that’s not uncommon in presidential election years when anxiety over a change in administration and eagerness to participate in the election incentivize green card holders to become citizens. But the jump in applications continued during the first six months of the Trump administration, and the collection of pending applications began to escalate. The latest federal count available showed that the backlog in Texas stood at about 103,300 applications at the end of March — up from about 30,500 at the end of March 2014. Coupled with administrative changes for federal immigration officials, the backlog has significantly expanded the processing time for naturalization applications submitted to the five regional U.S. Citizenship and Immigration Services offices in Texas, according to immigration lawyers and nonprofit groups working with green card holders across the state. In 2016, groups assisting green card holders estimated the entire naturalization process — including biometric security checks, interviews and citizenship ceremonies — took an average of five to six months. Some lawyers put that number as low as four months in some areas of the state, while others dealt with cases that extended up to the nine-month mark. Applicants now are waiting just as long to get an interview appointment with an immigration officer. In some areas of the state, lawyers estimate the process can take up to a year, with some lawyers warning clients that the process could take up to 20 months. U.S. Citizenship and Immigration Services’ estimated time ranges for processing naturalization applications vary widely. In Houston, federal officials set a processing time range between 17.5 and 19 months. In El Paso, the agency estimates the process can take anywhere from 7.5 months to 24 months. For some immigration lawyers in Texas, the backlog is rooted in the Trump administration’s changing priorities when it comes to immigration. They point to the ongoing rush of applications from immigrants who fear deportation despite their legal immigration status. They also noted that internal USCIS changes that require increased scrutiny for other types of applicants have seemed to pull resources away. And while the lives of most green card holders seeking citizenship are not interrupted while waiting in line, the backlog has forced some to put their lives on hold. In Houston, one green card holder has been unable to petition for reunification with a loved one who lives in the one of the seven countries that were part of President Donald Trump’s travel ban. Some green card holders have held off on traveling to their home countries to visit loved ones until they become citizens for fear of facing scrutiny on their return. One lawyer recounted a story of a delayed wedding. “People want to get married or immigrate spouses or vote or get a job that requires them to become citizens — it’s not that [the backlog] doesn’t hurt people,” said Jackie Watson, an Austin-based immigration lawyer. Federal immigration officials push back on claims of a growing backlog by pointing to their efforts to keep pace and even increase the number of individuals naturalized each year — approximately 700,000 to 750,000 individuals — across the country. 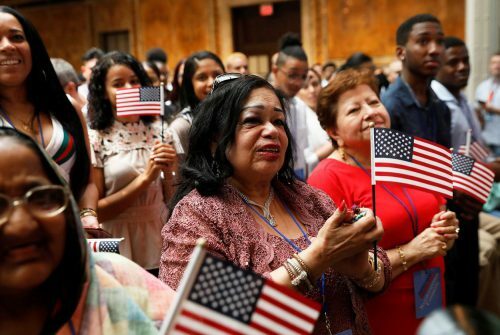 In an emailed statement, USCIS spokesman Michael Bars said the number of naturalizations was “virtually unchanged” despite a 35 percent increase in applications and at a time when officials are expecting to receive the most naturalization applications since 2008. USCIS officials did not specifically respond to questions about the increases in pending applications in Texas, which appear to be outpacing the national backlog. Nationally, applications did not significantly increase between federal fiscal years 2016 and 2017 like they did in Texas. And while the number of applications processed nationally slightly dropped from federal fiscal years 2016 to 2017, they dropped substantially in Texas. Other lawyers wondered whether the backlog was partly an issue of timing, pointing to regular slowdowns in processing after busy presidential election years. Houston attorney Brian Bates, who has practiced immigration law for more than 40 years, said federal immigration officials often ramp up processing efforts ahead of elections so green card holders can become citizens in time to vote. Then, they shift resources to other applications the next year. For those assisting green card holders through the process, the growing backlog in Texas amounts to what they call an “invisible wall” meant to deter even legal immigration as USCIS shifts toward an enforcement-driven agency focused on fraud and inefficiencies in the system. They note that USCIS revised its mission statement earlier this year to remove language that described the United States as a “nation of immigrants” and to emphasize American security. And immigrants living in Texas — even those who have resided here with legal immigration status for decades — have sensed a shift in long-standing rules and protections that came with a green card, said Silvia Mintz, a Houston attorney who has practiced immigration law for more than 10 years. Federal officials have responded to national outcry over the growing national backlog by characterizing it as a “dishonest and desperate attempt by open borders advocates to undermine” the work of federal immigration officials and law enforcement — a claim they repeated in response to Tribune questions. But the last few years have been transformative for the federal immigration agency, according to Julia Gelatt, a senior policy analyst at the Migration Policy Institute, a think tank based in Washington, D.C. From the agency’s mission statement modifications to policy changes coming down the pipeline, there are several changes afoot at USCIS that could have implications for naturalization and even keep green card holders from applying. “Under Trump, the backlog of U.S. citizenship applications in Texas is growing” was first published at by The Texas Tribune, a nonprofit, nonpartisan media organization that informs Texans — and engages with them — about public policy, politics, government and statewide issues.